The SharePoint Timer service runs in background to do long running tasks. The Timer service does some important SharePoint clean up tasks in the background but can also be used to provide useful functional tasks. For instance, there may be a situation when you want to send newsletters to your users on regular basis or want to keep your customer up to date with some regular timed information. This is part two of the series. Please read first post at http://blog.mmasood.com/2015/04/from-sharepoint-on-premise-to-office365.html of series "From SharePoint On-Prem to Office365"
I will be using SharePoint Timer Service to send an email to newly registered customers/users for this demo. The newly registered customers/users are stored in SharePoint list with a status field capturing whether an email has been sent or not. I am choosing WebJob as it is free of cost and I can leverage my Console application as WebJob. Please check http://www.troyhunt.com/2015/01/azure-webjobs-are-awesome-and-you.html why to choose Web Job. 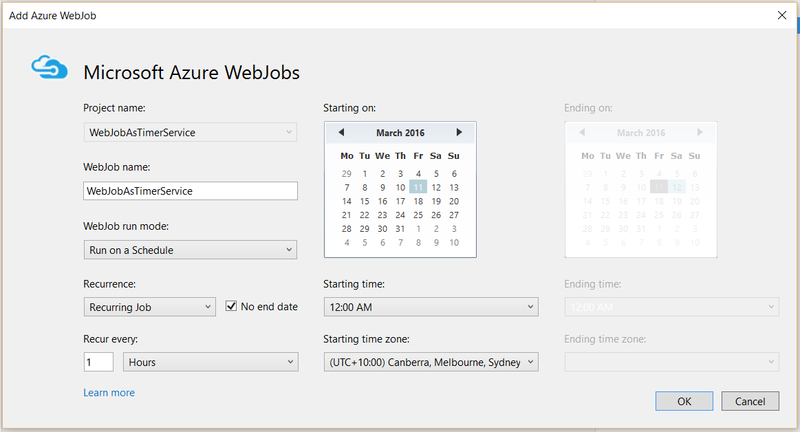 Azure web job does not live it its own. It sits under Azure Web Apps. For this purpose I am going to create a dummy web app and host my Azure web job. I will be hosting all my CSOM code in this web job. Continuous best fit for queuing application where it keeps receiving messages from queue. On Demand can be scheduled for hourly, weekly and monthly etc. Do not absorbs exceptions. Handle it first throw it to let web job know something went wrong. Try to avoid hardcoding. Maximise the use of configuration. It can be plugged from Azure portal as well.